The Benefits Aesthetic First impressions are important and a good looking work place reflects positively on your company, boosting its image. Customers and clients will feel welcome, impressed and comfortable, which is a great start to doing business with them. A well-designed work space shows thoughtfulness and attention to detail, contributing to a happier, more relaxed and productive environment for staff. Function Inside or outside, strategically placed plants can divide space, absorbing noise and creating a sense of privacy. A bank of plants between the road and the building can block traffic noise, while cleverly situated pots inside can reduce the feeling of being overlooked; creating personal space and reducing background noise levels. Health Printers, computers and other office equipment release chemicals such as formaldehyde, toluene, benzene, solvents and ozone. Gases like these are proven to cause headaches, coughs, sore throats and eye irritation. Plants are nature’s way of cleaning the air of such gases by absorbing and filtering emissions. They will also stabilise office humidity and reduce airborne dust levels, making an office with plants a healthier and more productive work place. Ease In order to look their best and thrive plants need care and attention. However, different plants need very different environmental conditions. Too cold, too dark, too much direct sunlight, too little water, too much water – getting any of these factors wrong and so having to repeatedly replace your plants can be a time consuming and costly business. The experienced team at Cycas takes care of everything. We will choose the right plant combinations for your building, select the right containers for your decor and design the best floor plan for your space. We source the plants, install them and then maintain them. 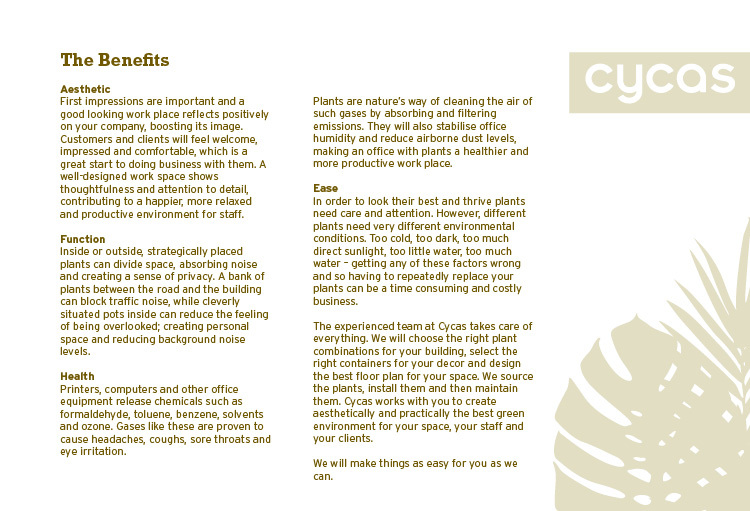 Cycas works with you to create aesthetically and practically the best green environment for your space, your staff and your clients. We will make things as easy for you as we can.